Price from: $785 - Book now! Welcome to Siem Reap, the provincial capital and gateway to the ancient Angkor Temples. Recognized as a World Heritage Site by UNESCO, the Angkor Archaeological Park encompasses dozens of temple ruins including Bayon, Banteay Srei and the legendary Angkor Wat. Our guide and driver will meet you at the airport and take you to your hotel for check–in. In the late afternoon, take an orientation walk around hotel area and later in the afternoon explore the Psar Chass, also known as the “Old Market". Our journey continues with visiting South Gate of Angkor Thom, with its majestic doors and artifacts. Then visit monumental temple of Bayon which is the heart of Angkor Thom. Later, visit the Elephant Terrace, Terrace of the Leper King and Takeo "Jewel of Crystal", which is dedicated to the Hindu God Shiva and was erected at the end of the 10th century. Leaving Angkor Thom by the North Gate, you travel to Preah Khan (Sacred Sword), one of Angkor’s largest temples, constructed in the 12th century by Jayavarman VII. You should not miss Ta Prohm Temple, which is a wonderful combination of human genius and natural beauty with its giant trees that have grown there for centuries. After the breakfast, we start the tour visiting Banteay Srei that is also one of the must- see sites. This beautiful temple was built in 967 AD by Jayavarman V's guru, it showcases the most exquisite, deep and complex carvings in all Khmer architecture. Next, we will drop in to visit Land Mine Museum where you will see a collection of thousands of landmines and learn the importance of clearing landmines in Cambodia. It tells a lot the history and culture of this amazing society. You also have chance to interact with a victim from landmine in a village nearby. Later in the afternoon, you will have a leisure tour to visit Butterfly Center and spend some time in spectacular surroundings filled with rare and vivid butterflies. improve the livelihoods and reduce poverty in the countryside). Check in to the homestay and enjoy a welcome dinner. Accommodation: Homestay in Siem Reap. Ox cart tour (Visit sugar palm village and farmer rural life). - Activities for Rice or Vegetable plantation. - Return to homestay and enjoy lunch. - Activities for Making Krolan (Cooking rice in Bamboo). - Making Rice noodle. Student can enjoy their testing with fish soup. - Dine Khmer Dinner set menu at homestay. Today is yours. Enjoy the rest of the day at your leisure to relax and explore this charming town. Enjoy breakfast at your hotel then set out on a drive to Kampong Thom, home to Cambodia’s most impressive group of pre–Angkorian monuments. Here we will visit the ancient temple complex, Sambor Prei Kuk, situated just north of Kompong Thom. The main temples are divided into three complexes, all dedicated to Shiva. Enjoy the serene atmosphere as you wander through these 7th century brick monuments, artfully scattered about the jungle. Return to the town of Kampong Thom in the afternoon and proceed to Paray Village for dinner and a homestay. Accommodation: Home stay in Paray Village. Today we travel to Kratie, a vibrant riverside town and home to the endangered freshwater Irrawaddy dolphins. Stop for breakfast at a local restaurant and then continue on to tour to the Cham Ka Lour rubber plantation, before crossing the Mekong River by ferry at Stung Trong/ Krochmar district of Kampong Cham province. Arrive in Kratie in the afternoon and check in at your hotel. Then drive north of town and take a local boat to view the freshwater dolphins that inhabit this stretch of the Mekong. Enjoy an hour on the river, before returning to the quaint French colonial town for the evening. 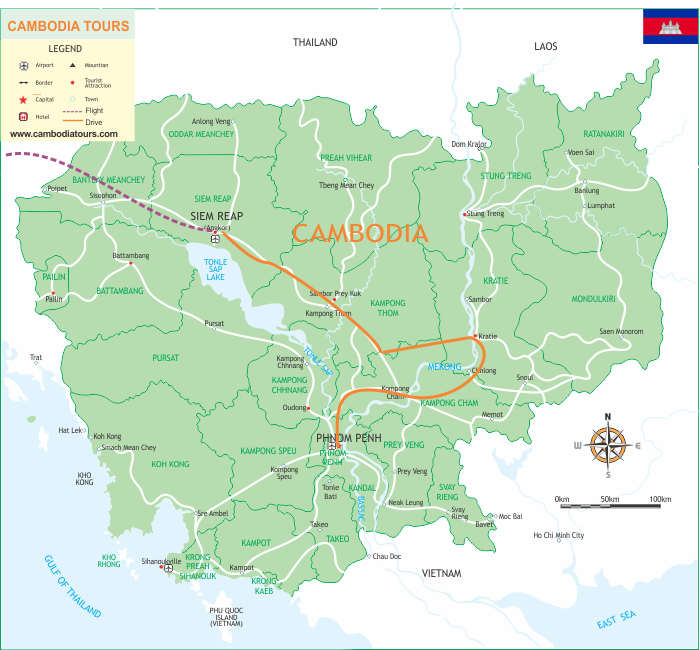 Today we continue our overland expedition, leaving Kratie and passing through Cambodia’s largest rubber–producing region on our way to Kampong Cham. Admire the contrast of lush vegetation and red basaltic soil as we drive through the countryside. Arrive in Kampong Cham in the late morning and visit the Wat Nokor Pagoda. This 11th century Mahayana Buddhist shrine is home to a large reclining Buddha as well as many carved Buddha images. In the afternoon we continue on to Cambodia’s capital, Phnom Penh. Check in at the hotel then enjoy the rest of the evening at your leisure. Welcome to Phnom Penh, Cambodia’s vibrant and bustling capital city. Despite its recent turbulent history, Phnom Penh’s wide tree–lined boulevards and faded colonial mansions hold an undeniable charm. Phnom Penh was founded in the 14th century and has long been a vital trading hub at the confluence of three rivers: the Mekong, Tonle Sap, and Bassac. Start the day learning about the Khmer Rouge and Cambodia’s recent history on a guided tour of the Tuol Sleng Genocide Museum and the notorious Choeung Ek “Killing Fields”. Get the better inside of Cambodian life, we will stop at Russia market, where you can find anything from motorcycle parts to valuable gems. In the afternoon, visit Royal Palace, which is now home to the royal family. In the northern section of the palace grounds lies the Silver Pagoda, the most sacred one in the country and The National Museum. Have breakfast at the hotel, our driver will transfer you to Phnom Penh International airport to catch your departure flight home. Bon voyage!